In a 4-quart Dutch oven, cook pasta according to package directions except omitting the salt; add broccoli to pasta for the last 3 minutes of cooking. Drain and return to Dutch oven. Stir in tomatoes, beans, tomato paste, garlic, salt, and pepper; heat through. Stir in parsley. Sprinkle each serving with cheese. 92% less sat fat • 50% more fiber than the original recipe. 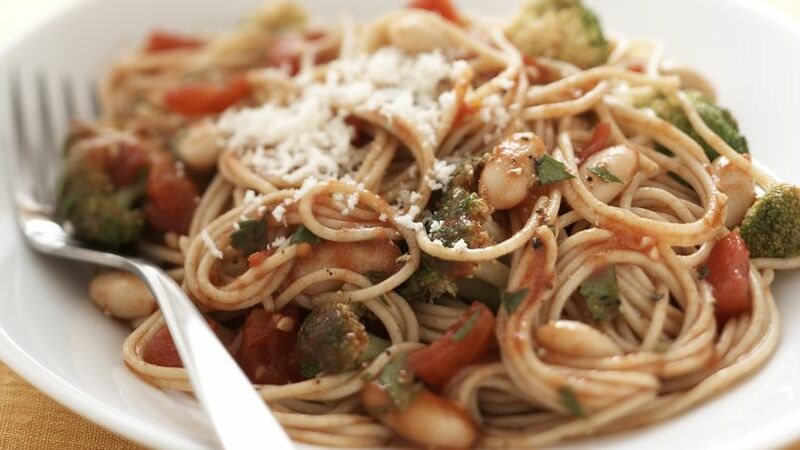 Twirl forkfuls of hearty, whole-grain spaghetti, tossed with a simple tomato sauce and good-for-you cannellini beans and broccoli.